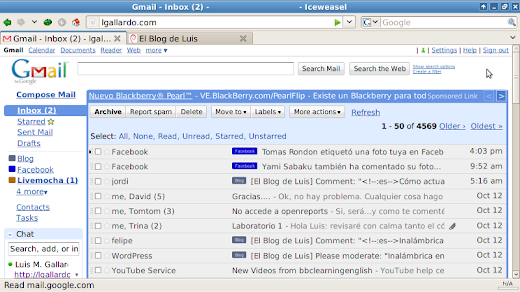 Think in English, turn your email into English! There are many ways for keeping your English alive, some of them require dedication or time consuming tasks but you can also do small things that can help you to keep in touch with the language. For instance, as simple as setting up your PC desktop's environment to English will make you think in English, so every time you copy a file, set a new device, install an application or turn your computer off you'll be interacting with your system...in English! You can also change the language of your applications so every time you use your browser, copy-and-paste something or write a document in your word processor you'll be doing it in English. This also applies to sites where language settings can be changed, like Hotmail, Yahoo or Gmail. 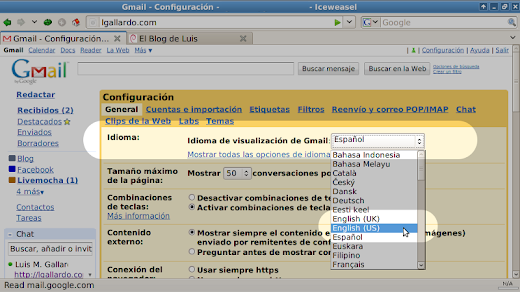 As an example, let's see how to set up your Gmail account in English. 4. 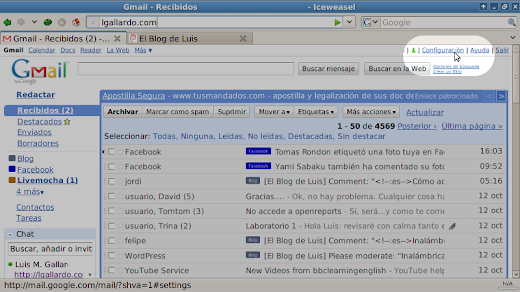 Now, your Gmail account is in English! At the beginning it could be a little tough because you might be used to how things are written in Spanish, but after a while you'll find yourself working as you would do it with your PC set in Spanish. You can even extend this idea to your cell phone, so every time you write a SMS or make a call, you'll be using what you've learned in English! !